Christos Papademetriou, teaches at the University of Neapolis in Pafos since 2010. He is a Lecturer in Management at the School of Business Administration. 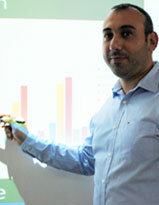 He is also teaching in the Department of Business Administration at the Open University of Cyprus (2017 until today). He obtained a ΒΑ (Hons) in Accounting and Business (2001) and MA in International Management (2002) from the University of Sunderland. He was awarded also a BSc (Hons) in Computing and the Postgraduate Certificate from the University of Portsmouth. He holds a doctorate (PhD) in Social Science from the University of Leicester, UK. The title of his thesis is “Investigating the Impact of Sequential Cross-Cultural Training on the Level of Sociocultural and Psychological Adjustment of Expatriate Mangers”.